The Kansas City Roller Warriors 2015 season really has been phenomenal, and although that’s nothing new, it really, really has been phenomenal. The reasons are many. This league has always known how to put on a great show for its fans, but here and there, there have been seasons in which the suspense was somewhat muted by the fact that we always seemed to know who was going to win games before they happened; see the 2010 and 2011 seasons in particular. Well, that’s a problem we don’t have this year, and if you ever needed proof that this sport, like many others, tends to be cyclical, you’ve found it in this year’s Dreadnought Dorothys. The house has been dropped. The Dorothys claimed six consecutive Rink of Fire championships from 2006-2011, then endured three consecutive seasons (2012-2014) with nary a win to their credit. This season, that all changed, and they’re poised to claim their seventh Rink of Fire title in the 11 distinguished seasons this incredible league has been on the track. 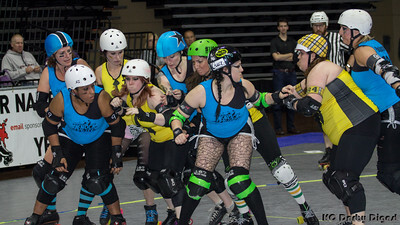 The 2015 Rink of Fire Championship is this Saturday night, June 27, at Municipal Auditorium, and we’ve got a preview of what you can expect from these amazing teams. Speaking of the cyclical nature of sports, these two teams claimed the last two Rink of Fire titles — the Susans in 2013 and the Knockouts in 2014 — but haven’t quite had the same luck this year. Both teams go into this year’s third place grudge match with identical records of 2-4. 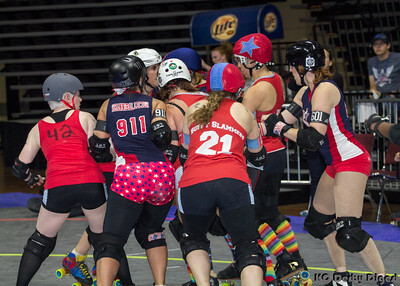 The KOs have been outscored this season 886-898, a deficit of 12, which isn’t much under the WFTDA rule set. The Susans have also been outscored 913-978, their deficit being a bit larger at 65. It’s also worth noting that this makes the Black Eye Susans the top-scoring team in the league this year, as well as the team with the most points allowed. Otherwise, the teams are pretty comparable. They’re both 1-2 in Underground games and 1-2 in “regular” games (held at Municipal), which makes their overall records of 2-4 identical as well. So what’s the deciding factor? The Knockouts are 2-0 against the Black Eye Susans this season, and because of that, we’re predicting a Knockouts win by about 40 points or so. That’s not a lot in WFTDA, and it’s definitely not a lot given the way this league has played this season, with some teams occasionally winning unexpectedly and then losing games they probably should have won. It’s going to be a great match-up regardless, because it always is between these two squads, and we can’t wait to see who comes out on top. The main difference between the two is that the Underground games consist of two 20-minute periods instead of the usual 30-minute periods. That’s an important difference because the shortened game clock means players foul out of the game after only five penalties instead of the usual seven. As a result, the second half of an Underground game can see players fouling out right and left, something you don’t normally see in a regular game. We’ll come back to that in a minute. So how do these teams stack up? There’s actually quite a bit to look at. The Dreadnought Dorothys and Victory Vixens come into the Rink of Fire with identical 4-2 records. They are 1-1 against each other this season. However, the Vixens’ win was a squeaker, final score 109-104, and it’s worth noting that it was an Underground game as well (shorter game clock, different rules). The Dorothys’ win over the Vixens was a “regular” (non-Underground) game, final score 132-96 — more decisive, but not overwhelming. Although we don’t have access to the stats, these numbers seem to suggest that the Dorothys perhaps run into more penalty trouble than the Vixens do. In that case, the Underground rules would work to the Vixens’ advantage. Drop these teams onto the track at Municipal, however, and the tide shifts: the Dorothys thrive, and the Vixens tend to struggle with that Underground advantage taken away. Although it’s impossible to quantify how particular player foul-outs affect the outcome of a game, it remains true that the Dorothys’ only two losses this season have been Underground games — and that, of course, points directly to the difference in rules, given their tendency to dominate otherwise. Overall, the Vixens, despite their 4-2 record, have been outscored this season 787-798, a deficit of 11. The Dorothys have outscored their opponents 863-775, a difference of 88 points in their favor, and they’ve outscored the Vixens this season in head-to-head competition 236-205. Although that’s well within any kind of margin of error, if there even is such a thing here, we’re predicting a Dreadnought Dorothys win by about 30 points. That’s a narrow margin. Even though the Vixens haven’t done as well at Municipal, where the Dorothys kind of reign, we expect the red, white, and blue to bring it in a big way at the Rink of Fire this weekend… right before the Ruby Reds claim their seventh house title. You can expect a hell of a battle this Saturday night, and we hope to see you all there. The Rink of Fire championship is this Saturday night at Municipal Auditorium. Doors open promptly at 5:00 p.m., first bout begins at 6:00. Tickets are $18 for adults, kids ages 6-12 are $9, and wee ones ages 5 and under are admitted free. 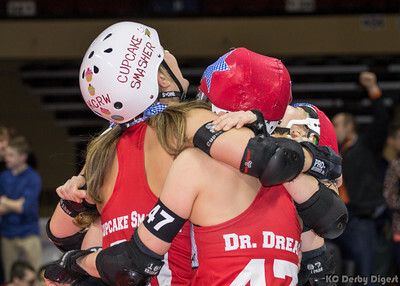 As always, KC Derby Digest will be tweeting scores and highlights all evening long as the games progress, so follow us on Twitter for that, and check out our Instagram page for exclusive, behind-the-scenes photos of KCRW and all the amazing roller derby leagues Kansas City is blessed with. We will see you Saturday night… at the Rink of Fire, baby. In reference to the DD v. VV bout, I went through the stats and here is the breakdown of team penalties for the DDs and VVs thought out the season (Note: the last UG game stats for DDs have not been completed yet). OK, good to know. So the numbers might not quite bear it out the way we’d speculated, although it’s still difficult to tell with that last DD bout missing. Based on wins and losses and where they happened, the only thing we could think of was that the reduced penalty allotment accounted for the differences in the teams’ win-loss patterns. There wasn’t any other obvious factor, at least to us fans. The Dorothys have averaged about 31 penalties per game this year, and if you add that to the rest of the season, that puts them at 188 to the Vixens’ 177. So assuming that missing bout was on par with the rest, we might have been right after all. Thanks a bunch, Doc, we’ll edit accordingly.